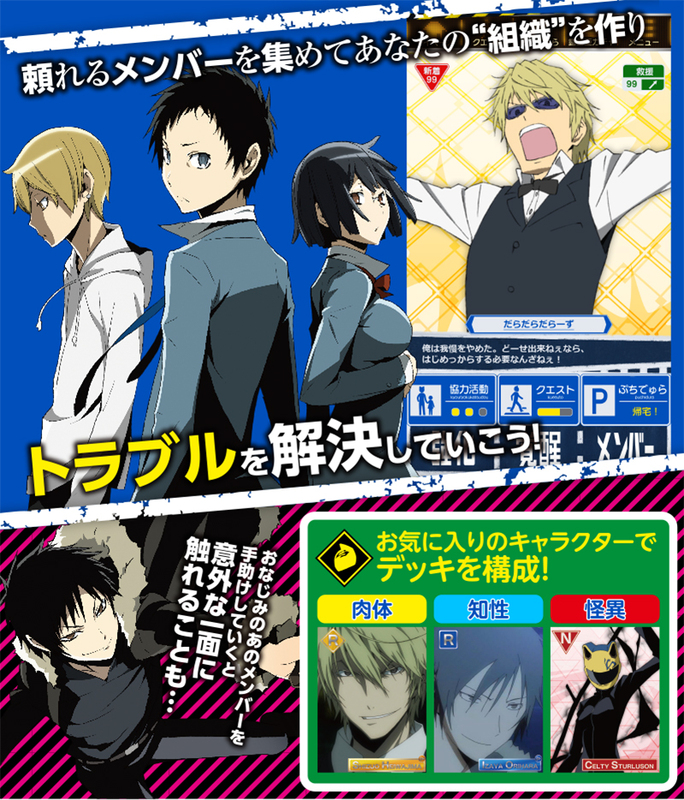 A new smartphone game based on Ryohgo Narita’s light novel series Durarara!! will be released by the mobile social company GREE. It is called Durarara!! the Underside, and will be available this coming spring. As of now, the company is accepting preregistration for the adventure game, where players can recruit characters from the series to create an organization following the instructions to come to Ikebukuro from a mysterious text. Those who will preregister will get a Mikado Ryūgamine SR card as a gift. On the other hand, its anime series Durarara! !x2 is scheduled to air its first part, Durarara! !x2“承” (Shou) this January 10, followed by Durarara! !x2“転” (Ten) in July. The third part of the sequel, Durarara! !x2“結” (Ketsu), will be televised in January, 2016. Posted in Game and tagged anime, Durarara! !, Durarara!! the Underside, Durarara! !x2, Durarara! !x2“結” (Ketsu), Durarara! !x2“転” (Ten), Durarara! !x2“承” (Shou), GREE, mobile game, smartphone game. Bookmark the permalink.